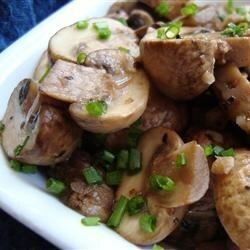 "Mushrooms are sauteed with your favorite herbs and white wine. Mmm!" A wonderfully yummy and easy accompaniment to steak. Remember that the mushrooms lose a lot of volume during cooking so be sure to start with far more than you think you'll need. This is a great recipe but, there's no need to cook down the wine. I just heated it. We couldn't stop eating them.